Described as a ‘great humanist’ and a ‘great poet’ by French President Nicolas Sarkozy, the Martinican writer Aimé Césaire, who has died aged 94, left his mark in black pride, anticolonial struggle and literature. Sarkozy's decision to honour Cesaire with a state funeral marked the the fourth time that a literary figure has been accorded such a distinction after Victor Hugo in 1885, Paul Valery in 1945 and Colette in 1954. There had even been calls by French politicians to have Césaire laid to rest in the Pantheon of national heroes in the Latin Quarter of Paris, alongside such literary luminaries as Victor Hugo and Voltaire, but few were in doubt that Césaire would not have wished for that. The state funeral was thus held in Césaire’s homeland of <?xml:namespace prefix = st1 ns = "urn:schemas-microsoft-com:office:smarttags" />Martinique. In attendance were President Sarkozy, his ministers, Socialist leaders Segolene Royal and Francois Hollande and three former French Prime Ministers - Laurent Fabius, Lionel Jospin and Pierre Mauroy. From the African diaspora, Senegalese Culture Minister Mame Biram Diouf and the Prime Minister of neighbouring Dominica, Roosevelt Skerrit, were also in attendance. Known far beyond his small island’s borders, Aimé Césaire was born in the Martinican community of Basse Pointe in 1913. He was a poet, dramatist, statesman, former MP for Martinique in the French National Assembly and mayor of its capital, Fort-de-France. Aimé Césaire also coined the term Nègritude. According to Césaire, Nègritude was the awareness of the cultural and historical consequences of being African or of African descent, in a still white-dominated world, and remaining proud to be black. Nègritude is what prompts the only two black people in a crowded room to acknowledge or smile at each other, maybe even strike up a conversation. The innate knowledge that perfect strangers have something in common – their blackness - which goes beyond experiencing the human condition. Nègritude encouraged black people to have pride in their African roots. He argued that the Caribbean people of African descent had been denied their history, and that their cultural heritage had been assimilated by force into white cultures. Its unique genius, he asserted, should be recognised and nourished - this was black identity. Nègritude was partly-inspired by the Harlem Renaissance of the 1920s when some of its most famous artists, including Langston Hughes, went to Paris in the early 1930s. It was also theoretically close to the works of Haitian Dr. Jean Price Mars. Although in his Cahier he evoked his childhood as poverty-stricken and squalid, his family was part of the island's small, black middle class, with his father employed as a tax inspector. The family moved to the capital, Fort-de-France, where Césaire went to the Lycée Schoelcher. He was a prize-winning student, easily adapting to the elitist French education system which was entirely alien to the great majority of Creole-speaking rural Martinicans. In 1931, he won a place at the Lycée Louis-le-Grand in Paris. Four years later, he was admitted to the prestigious École Normale Supérieure, where he studied literature and philosophy. There, he met his lifelong friend, fellow proponent of Nègritude, and the future first President of Senegal, Leopold Senghor. In 1937, he married another student from Martinique, Suzanne Roussi, with whom he eventually had four sons and two daughters. It was while studying in Pairs that he wrote his seminal work Cahier d’un Retour au Pays Natal or Notebook of a Return to my Native Land. Like Joseph Zobel’s Rue Cases Nègres, the Cahier was originally banned by the French authority, but later published and translated into many languages. Circulated secretly, it was arguably the most influential work ever written so far as Francophone African and Caribbean people were concerned. Césaire believed that the Cahier spoke to a people who "had invented neither gunpowder nor the compass Those who never knew how to subdue neither steam nor electricity Those who have neither explored the seas or the skies first. But without whom the earth would not be the earth." Césaire cited the heroism of Toussaint L’Ouverture, the histories of Asante, Djenné, Mahdis, Dahomey, and the most important city of the medieval world, Timbuctu. Perhaps most powerfully, he pointed out that despite the humiliations and savagery of slavery, we were still here, refusing to buckle and we had only just begun to discover what we could do. He reminded us that we built Bordeaux, Nantes, Liverpool, Bristol, Virginia and New York, so who were we to be so convinced of our own worthlessness? "No race possesses the monopoly on beauty, intelligence, or innate power", he wrote. The Cahier was eventually published to acclaim in the highest of French literary circles. Jean-Paul Sartre wrote: “Surrealism, a European poetic movement, is stolen from the Europeans by a black man who turns it against them.” The father of surrealism, André Breton, praised Cahier in the highest terms. He also offered the backhanded compliment that what was perhaps most amazing was that this brilliant piece of literature was produced by a black man, but this was still only the 1940s. More than a powerful orator and writer, Césaire was also, like Senghor, politically active. It was he who steered the now-controversial decision for Martinique to become a fully-fledged part of France in 1946. While other colonial nations were seeking independence in the post-war period, Césaire wanted France to take her colonial possessions seriously, to take responsibility for their development and inhabitants. He served as member of the French National Assembly from 1946 until 1993, and was elected mayor of mayor of Fort-de-France from 1945 to 2001. Césaire broke with communism in 1956 over the Soviet repression of the Hungarian revolt. He formed his own socialist party, the Parti Progressiste Martiniquais (PPM), concluding that Moscow cared nothing for black freedom. Instead, Césaire concentrated on liberating the Third World from Western imperialism by cultural means. Césaire’s 1950 polemic, Discours sur le Colonialisme (Discourse on Colonialism), is essential reading for anyone interested in the effects of the colonial experiment. Some sixty years later, Martinique’s political status is now inconceivable to the English - an anachronism left over from a bygone age. Most Martinicans are aware of their complete alienation from their Caribbean neighbours, but are far too busy counting their Euros, driving along their motorways, or travelling on their French passports to protest too loudly. Most ‘metropolitan’ French people don’t see an issue in this duality. 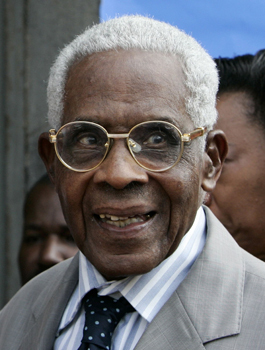 I had the honour of meeting Césaire twice in 2005. Clearly of formidable intelligence, even in his very advanced years, his hopes for Martinique’s future were mixed. Aimé Césaire’s literary legacy is uncontestable – he received numerous prizes in his lifetime including one from UNESCO. His 60 year-old writings on colonialism still form the starting point for almost all university courses in the UK considering postcolonialism. He is, after all, the man who boldly wrote that Hitler’s greatest crime was treating white people as black people had been treated, quite legally, throughout the colonial period. Césaire’s political legacy is far more mixed. Without Césaire, there quite possibly would never have been a Frantz Fanon, nor an international Black Consciousness movement in the 1960s, but perhaps today Martinicans would be able to receive their PIN numbers from Fort-de-France, rather than Paris. Césaire had a charismatic presence, yet with it, he was gentle and impeccably polite, a contrast with his powerful and violent writings. After he stepped down from the office he had held for more than half a century, he was made honorary Mayor of Fort-de-France. His 90th birthday was celebrated with much pomp in 2003, and he continued to receive a stream of distinguished writers, academics and students until his death. Césaire’s works include, Cahier d’un Retour du Pas Natal, Discours sr le Colonialisme, La tragédie du roi Christophe (The Tragedy of King Christopher) published in 1963, Une tempête (A tempest ) in 1969 Les armes miraculeuses (The Miraculous Arms) in 1946; Soleil cou coupé (1948), translated as Beheaded Sun in 1972, and Corps perdu (1950) translated as Disembodied (1973). Aimé Fernand Césaire, author and politician, was born on June 26, 1913. He died on April 17, 2008, aged 94. His wife, Suzanne Roussi, with whom he had six children, but from whom he had long been separated, died in 1968.